We are happy to announce that some of our products are now available on ebay. The store of Otakara Japan in ebay is selling our products. 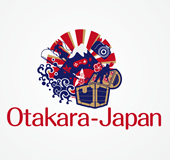 Otakara-Japan” will send the various “otakara” collected from all over Japan for everyone around the world. Pagong is also accepting email orders from overseas. We will send products by Japan post service, EMS. The payment method is only by Paypal. Please email from this link, if you would like to order directly.